Work ethics is the intangible quality that “star” employees exhibit daily in their determination to do the best job possible—regardless of whether anyone is watching. These stars are the workers employers look for among dozens of applicants for every job. 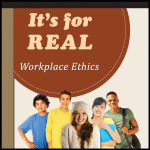 It’s for Real Workplace Ethics empowers your students with the professional ethics expected by employers and teaches the consequences of poor work ethics. Sixty-four lessons – 16 in each of four series – follow five teenage friends who encounter ethical dilemmas in their part-time jobs. Each lesson addresses a different ethics topic that requires critical thinking and problem solving through the use applied activities, pre- and post-tests, cartoons, an advice column, a blog and end-of-lesson assessments. Series I through III focus on the ethics of employees. Series IV highlights ethics of employers that impact employees. Access an interactive It’s for Real Workplace Ethics demonstration lesson, and you will appreciate the creative way this program uses stories, applied activities, pre- and post-tests, end-of-lesson assessments, cartoons, an advice column, and a blog to motivate students. You can use It’s for Real Workplace Ethics as an individualized learning experience or as a teacher-directed activity. Try a lesson as our guest! Click here! Click to view It's for Real Workplace Ethics topics and pricing information. When you use the online version of It’s for Real Workplace Ethics with The Teacher’s Desktop, your time-consuming tasks will be greatly reduced by these shortcuts. The CD version of It’s for Real Workplace Ethics contains the student program only and does not include The Teacher’s Desktop. Scores are reported to students only.